Around 8.30am I decided to call for a taxi to take me to Gare du Nord Station - giving me plenty of time to arrive. Oddly enough the voice speaks to me in French - odd since it's the English speaking operator line. I do my "parlez vous anglais?" bit to which he replies in the affirmative. I give him my address, he checks and comes back with "I have no taxi available". "Okay" I cheerily ask "What about at 9?". "No", he quickly responds "we don't do bookings." And with that, there went the idea of having a taxi pick me up. I suppose it might have something to do with that egalitarian thing - can't have anyone gaining an advantage. It was now, onto plan B (the one recommended by guide books), go to a taxi rank. Since the closest (that I knew of) was on Place Maubert, I decided to try my luck. The paths are quite level and mostly intact, and there aren't too many "puddles" to wheel around - and that dear readers, is always a good thing. 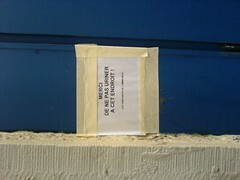 At the rank there were already 3 people waiting, and the Place Maubert market was up and running again. I resisted temptation - easily done when encumbered by luggage. It's a haphazard thing, you wait until a taxi decides it wants to stop - there's a rough notion of a queue, but that doesn't stop anyone from nabbing a taxi that you didn't quite see. One taxi briefly stopped to see if I was going to the airport - since I wasn't, he was off. A man asked me in Spanish how long I'd waited, so naturally, I answered him in French. He then relayed the info onto his companions. Make of that what you will. A 15 minute wait or so and I'm in the cab going to the station. This driver seems to take the more direct root - the resulting fare proof. With a bon voyage, I enter the station. And might I add, I never got to see this side of it, but it's quite an attractive structure - something that shouldn't really be pissed upon. From Gare de Nord to Bruxelles-Midi on the Thalys - travel time, a speedy 1 hour 25 minutes. 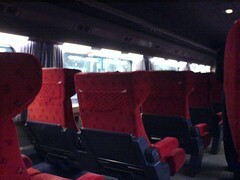 The trains are unmissable in their deep red livery and have certainly been a success. Air France ceased flying the Paris-Brussels route in 2001 due to low passenger numbers - 450 daily air passengers compared to 13700 daily Thalys passengers. Inside you'll find yourself cocooned in shades of silver and red. One part of traveling in first class is that you are offered a complimentary breakfast. Oh dear. Breakfast consisted of coffee (served with one of those capsules of milk, this one was called "Tastes like fresh milk" so I freaking well hope so! 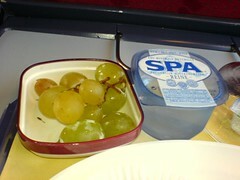 ), water, grapes and pastry of choice. The grapes as you might be able to tell from the second photo looked half rotten - totally unappealing. 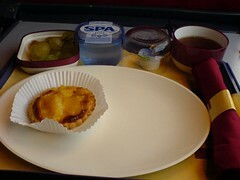 The pineapple tart was quite nice and the stewards did come around and insist I take another of their baked delights. 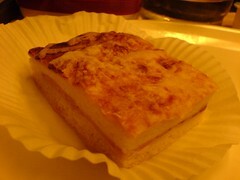 This time it was some kind of ham and cheese brioche. It was tasty enough. One extra bonus offered to first class passengers is a taxi service. Excellent. After the wait at Paris, this offer was too good to pass up. Basically you hop off the train and a driver will be waiting to take you away - no queues! You just fill in the card on board and hand it in to the stewards and they did the rest. Why couldn't Eurostar do this? It all panned out on arrival - the taxi controller efficiently passed me off to a driver who seemed to be in quite a hurry to get to his taxi, even taking a bag so we'd go a little quicker. He was a fairly friendly chap who seemed to know where we were going but there was something missing. No taxi meter. We had to do a bit of a round the block thing as we neared the accommodation due to the one way streets but we arrived fairly speedily. How much for the trip? He smiled, €25. I'm going to have to watch out for that smile in the future. As I stood at the door of the B&B, I saw a sign that was attached on the neighbouring building, which made me recoil in disgust and laugh out loud. I hope this isn't a foreshadowing of things to come. I just really really really hope they obey the sign.